Alex Song gets a red card for hitting Mario Mandžukić. The 26-year-old committed a cynical foul, and was rightly sent off by the referee in the 40th minute. 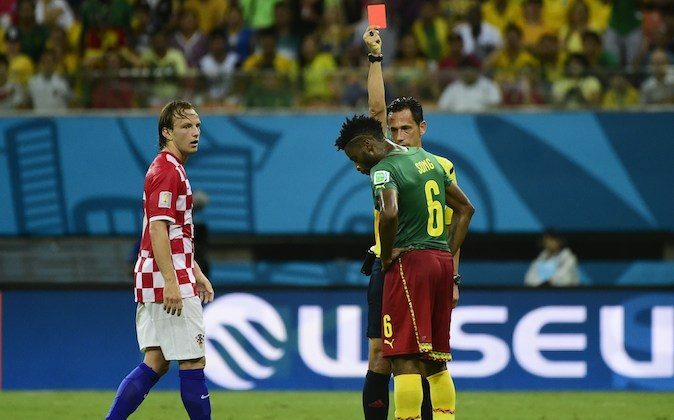 According to ESPN, Alex Song’s cousin, Rigobert Song, was also given 2 World Cup red cards for Cameroon — 1 in 1994 and another in 1998. Check out two videos of the incident below. RIO DE JANEIRO (AP) — The magnitude of Spain’s opening 5-1 loss to Netherlands comes into sharper focus Wednesday when the defending champions must fend off World Cup elimination against Chile, less than a week into the tournament. Spain and 2010 runner-up Netherlands were expected to advance from Group B, but plenty of pundits — including Brazilian great Pele — tipped Chile as a genuine contender to progress at the expense of one of the European powers. The Chileans opened with a 3-1 win over Australia, and a second straight victory by the South Americans almost would certainly knock Spain out of the competition. The Dutch play Australia, the lowest-ranked team in the tournament, in the first of Wednesday’s three matches. That is followed by Spain vs. Chile and the Group A match between Croatia and Cameroon. THE CHANGE IN SPAIN: Spain coach Vicente del Bosque stuck with the core group of players who have helped deliver two European championships and a World Cup in a tremendous streak starting in 2008. But after the humiliating loss to the Netherlands, he has forecast changes. Spain needs at least a draw against Chile to remain in contention. There’s speculation that Cesc Fabregas could replace Diego Costa and Pedro Rodriguez could come in for David Silva. Captain and goalkeeper Iker Casillas’ spot is also under close scrutiny. Chile hasn’t beaten Spain in 10 games. Big games by Arturo Vidal and Barcelona forward Alexis Sanchez are crucial to Chile’s chances. Vidal, the creative midfielder from Juventus, is recovering after knee surgery and played for an hour against Australia. Venue: Rio de Janeiro. Kickoff: 4 p.m. local time (3 p.m. in New York, 8 p.m. in London, 4 a.m. in Tokyo). DUTCH TREAT: Even after its stunning win over Spain, Netherlands doesn’t want to leave anything to chance when it comes to qualifying for the next stage. That means Australia could be in serious trouble. Netherlands coach Louis van Gaal’s strategic masterstroke of playing a 5-3-2 formation worked perfectly against Spain as his team blunted their attack and then made the most of the counterattacking opportunities. Forwards Robin van Persie and Arjen Robben capitalized by tearing the Spanish defense to shreds. Even so, van Gaal may revert to a more traditional Dutch 4-3-3 system against Australia, which has had two injury setbacks since its opening loss: defender Ivan Franjic and veteran midfielder Mark Milligan are ruled out with hamstring injuries. Australia coach Ange Postecoglou doesn’t want his team to sit back and try to defend the whole match, and he has given them orders to attack at every opportunity. Getting the ball to Tim Cahill, the Socceroos’ all-time leading scorer, is the key for Australia. Venue: Porto Alegre. Kickoff: 1 p.m. local time (noon in New York, 5 p.m. in London, 1 a.m. in Tokyo). ETO’O AND OUT: Both Cameroon and Croatia are looking to bounce back from defeats, with Cameroon losing 1-0 to Mexico, and Croatia enduring a 3-1 loss to Brazil in the tournament’s opening match. It appears Croatia has come out of defeat in better shape than its African rival. Chelsea striker Samuel Eto’o had a brace on his right knee as the Cameroon squad left its training base to travel to Manaus and already has posted on social media that he’s unlikely to play against Croatia. Losing the captain is a big setback for Cameroon, which has won just one of its 13 World Cup games since reaching the quarterfinals in 1990. Barcelona’s Alex Song will have to take on extra responsibility in midfield, while Mainz forward Eric-Maxim Choupo-Moting is likely to cover for Eto’o and 22-year-old Lorient striker Vincent Aboubakar may get his chance at the World Cup. Croatia playmaker and Real Madrid midfielder Luka Modric is expected to recover from a foot injury and take his place against Cameroon. The Croatians were furious about a penalty awarded to Brazil in their opening match, which allowed the home team to take the momentum, and are desperate to put that behind them with an important win. Venue: Manaus. Kickoff: 6 p.m. local time (6 p.m. in New York, 11 p.m. in London, 7 a.m. in Tokyo).